If there’s anything more thankless than going in to the office and trying to get some work done on the day before Thanksgiving, it’s got to be posting a blog later that same night when it’s virtually guaranteed that absolutely no one is going to be paying attention. The only thing in my favor is that here on the east coast we got the first snow of the season, so many potential readers might just be sitting the night out at home. I’m not holding my breath on that, of course, which is why you’re reading this process piece instead of seeing anything remotely resembling meaty content. After more years that I want to think about, I really do have a sense for how scheduling drives the number of posts. It’s a blessing and a curse since it means sometimes I’ll withhold some good writing until I know more than a few people will be paying attention. It also drives the fact that I almost never post on Friday and Saturday. Sadly the world has better things to do on those days than listen to another blow hard ranting on the internet. I’m not selling any advertising here, but still it’s nice to know that what you write has got a fighting chance of being seen… because no matter how much noise we make about writing for ourselves and not for an audience, we really, really want the audience. So as you’re sitting there, toasty warm in front of your pre-Thanksgiving fire, sipping your nog (or whatever it is you’re supposed to sip at Thanksgiving), think of the poor harried bloggers out there smashing away at their keyboards and wanting nothing more than a few more people to drop by their site. Take a little time tonight and poke around WordPress or Blogger and there’s a good chance you’ll run across someone whose voice you need to hear. It’s a jungle out there, but there are some incredibly good writers too who are just churning it out for the love of our particular game. Before I crash for the evening I just wanted to say thank you for making today the “most viewed” in the short, but eventful life of jeffreytharp.com. 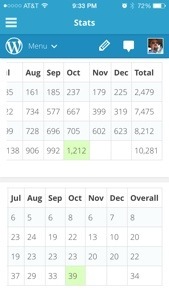 With 1,233 visits, an average of 40 visits per day, and a one day record of 148 visits, October was a good month for jeffreytharp.com. The only sure thing I’ve learned from running a blog this long is that you can never expect success. It’s best to go into each post assuming that you’re writing to satisfy an audience of one: yourself. That’s why I’m savoring the high points when they come – especially since the last record setting month was back in May 2011. What that trend tells me is that apparently people like to see ranting about work (May 2011 I was in the final stages of escaping my previous employer) and raging about government ineptitude (This past October saw the latest government shutdown and endless incidents of political asshattery). As tempting as it is to chase that trend, I don’t think that’s what I want to spend all my time writing about. The reason I’ve never settled into a topical niche is that I tend to be interested in whatever happens to go on around me on any given day. Maybe that’s a character flaw, but it does give me wide latitude when it comes to picking topics. I very much like having latitude. So with that said, I’m just going to keep doing what I’ve been doing around here for almost four years now. I’ll keep writing, you keep reading, and we’ll see if we can’t set a new record sooner rather than later. And because I don’t do it often enough, let me just say thanks to everyone who’s reading along at home, those who impart a snarky word from time to time, throw me a like, or even just shake your head in amazement that someone would bother to manage this much schlock on the internet. This is definitely the best non-paying job on the internet, but I still have a few surprises up my sleeve for the future so let’s go ahead and plan for the best being yet to come. 1. Begging. Tonight’s the night when all you parents out there send your children mixed messages by encouraging them off to talk to strangers for candy. Fortunately the houses in my neighborhood are far enough apart that it’s not particularly lucrative bit of ground to cover, so there aren’t typically herds of children wandering around looking for a handout. It’s not so much that I mind the giving away of candy, but like the 4th of July, it’s one of those nights that threatens to send one or both of the dogs over the edge every time they hear the gate close or someone knocking on the door. Then again there’s the unmitigated glee when I open the door so parent and child are faced with a surly looking bald man with two barking dogs at his back… so at least there’s that. 2. Getting Close. Earlier this month it looked like jeffreytharp.com was well on its way to having its best month ever in terms of unique views. WordPress was regularly reporting daily views of 50 or 60 people. On October 3rd, the site posted its biggest single day. Since this past Sunday the number of views per day have plummeted for reasons I haven’t been able to identify just yet. At the rate they’re hitting now, I’ll be lucky to bring in 50 or 60 views this week. Alas, such are the vagaries of the internet. As October draws to a close, I’ll have to content myself with having the 2nd best month in the blog’s short history… and start worrying about how to keep November from ending up recorded as the 2nd worst. 3. Indecision. You can accuse me of a lot of things, but being indecisive is generally not one of them. Right, wrong, or otherwise, when confronted with possible courses of action I’ll pick one based on the best information I have available at the time and move out smartly. I’ll never claim to make the right decision all the time, but I’ll by God make one instead of just sitting around waiting for something to happen. Whether it’s where to have lunch or which program to throw over the side, I wish the populace at large would just stop pussyfooting around and figure out what they want to happen. Walking through life having other people’s bad decisions foist upon you is simply piss poor planning. As far as I’m concerned, any decision made on the spot is better than a great decision made ten minutes too late.